Amtrak is always looking for ways to make our customers’ experiences on board even better. 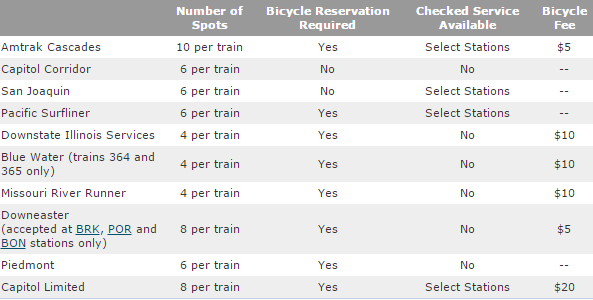 We’ve recently added some bike transportation options to our routes, and want to update you on the ways you can use Amtrak to take you to the many beautiful biking trails America has to offer, or to the next big race. Recently, we’ve partnered with organizations within the biking community to accommodate bikes on some of our routes. This task force has advised us on the needs of the biking community, as well as how important easy and accessible bike service is to intercity and cross country transportation. The Missouri River Runner Amtrak route--which parallels the Katy Trail for much of its length--has included roll-on bicycle service since the 1990s, when MoBikeFed leaders worked with Missouri legislators and Amtrak to create the service. Recently we have been working with a coalition of bicycle advocacy groups from across the country who are working to bring this service to more Amtrak routes nationwide. 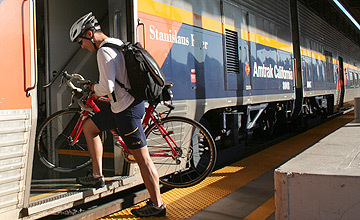 In 2015, Congress approved a law requiring Amtrak to study improvements to stations and passenger experience, including bicycle roll-on. We hope that the study required by this new law will create an opening to expand bicycle access to Amtrak across the system. In addition, MoDOT is still working with a coalition of several states to acquire new rail cars for Amtrak routes in Missouri, including the MO River Runner and the Kansas City-Chicago routes. These new rail cars should dramatically boost the number of bicycles per train that Amtrak can comfortably carry. In addition, loading and unloading bicycles and other luggage will be far easier. Stay tuned. Bicycle roll-on access to trains is routine and universal in much of the world. It is unfortunate that Amtrak is so far behind in making this basic level of service availble. The good news is, we are now making progress on this issue nationwide. 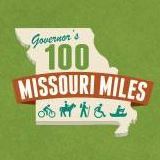 Building a world-class transportation system for bicycling and walking in Missouri is one of the four primary goals in MoBikeFed's Vision for Bicycling and Walking in Missouri. Allowing easy intermodal use of our national transportation system--like bicycle roll-on for Amtrak--is one way we can reach that goal. Your ongoing membership and generous financial support helps turn out Vision into reality!